These pancakes are so much better than pancakes from a store-bought pancake mix–and almost as easy to make! Just keep the mix stored in an air-tight container and you can whip up pancakes any time. A few tips: don’t over mix the batter. It’s okay to have some lumps. Be sure to use fresh baking soda. Once you’ve ladled your pancake batter, leave it alone until it’s time to flip. You should use up the pancake mix within 3 months. Leftover cooked pancakes can be frozen and reheated. Whisk together the egg whites and buttermilk in a small bowl. In another bowl, whisk the egg yolks with the melted butter. Combine the buttermilk mixture with the egg yolk mixture in a large mixing bowl and whisk together until thoroughly combined. Pour the liquid ingredients on top of the pancake mix. Using a whisk, mix the batter just enough to bring it together: don’t over mix. Lightly butter the griddle. Wipe off thoroughly with a paper towel. (You can skip this step if you’re using a non-stick griddle). Gently ladle the pancake batter onto the griddle. When bubbles begin to set around the edges of the pancake and the griddle-side of the cake is golden, gently flip the pancakes. Continue to cook 2- 3 minutes or until the pancake is set and golden. Serve immediately. Makes 12 pancakes. I love this! By making a batch of this mix, pancakes can be ready in no time which will make my life so much easier especially during hectic mornings. Thanks for sharing! Thank you for posting this recipe! 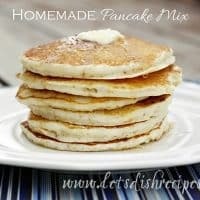 I’ve been searching high & low for a pancake mix recipe, but all the ones I have come across called for dry buttermilk powder or dry milk powder and I hated having to buy a whole box of that stuff and only having to use a small amount. I’m going to whip this up right away! i am so excited about this recipe…thanks for sharing. 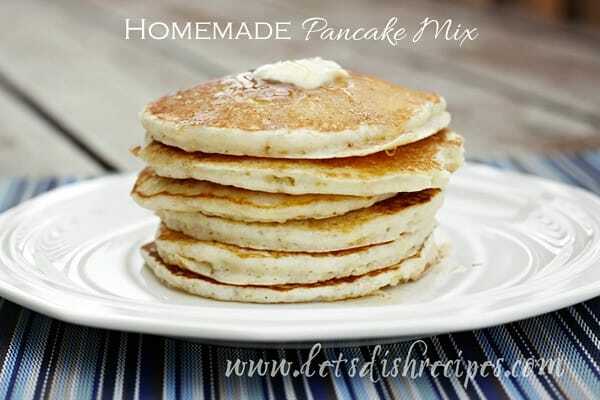 I am so excited to see the post of homemade pancake mix of yours. I was on hunt for this recipe frm quite long as I usually use to make pancakes for my little one from the readymade version. will this for sure and today only. thanks for sharing the tips ! I LOVE making pancakes, but making homemade pancakes are truly the BEST!!! THANKS for stopping by and leaving a NICE comment, visit anytime.